Enjoying a natural setting doesn't mean losing sleep in a tent. You can experience Uluru's raw beauty, in 5-star comfort at Sails in the Desert, a member of Pullman Hotels. After an envigorating hike, the Red Ochre Spa is just the place to relax or perhaps visit the Mulgara Gallery to view the stunning Indigenous artwork on display. Standard Rooms feature modern bathrooms, twin queen beds or deluxe king, and can accommodate up to 5 people. All rooms offer air-conditioning, TV, movies on demand, minibar and bathrobes. Spa Rooms have extended balconies with an open-air spa. Deluxe Suites are over twice the size of the Spa Rooms and provide separate living, dining and sleeping areas. Suites feature multiple balconies overlooking the garden and an indoor spa. Ilkari takes its name from the local Pitjantjatjara word for sky. Ilkari establishes its dining philosophy in the natural flavours of the finest produce available under the Australian sun. This reward comes to life with live cooking stations. Walpa Lobby Bar offers a relaxed setting for coffee and cake, casual lunch or dinner, a pre-dinner drink or night cap after a sunset tour. Walpa Lobby Bar is contemporary and welcoming. The best place to stay while there! We stayed here for 4 nights! Great location. Shops and restaurants all close by. Hotel restaurant very good. Great pool area. Hotel gardens kept well and look great! Overall service very good! Reception staff all excellent. Room large and well maintained. If I had to comment on any negative the only thing I can add is the room was beginning to look a 'little tired'. There was black mold on the tiles in our bath / shower and the carpet was well worn in some spots! But these were minor things, overall the hotel was great and I'd recommend it! We stayed at Sails in the Desert Hotel for 4 nights. Upon arriving we were greeted by the friendly and efficient reception staff. We have to mention Justin's very helpful service. His attention to our needs was exceptional. Our room was spacious and contained everything we needed. Plenty of lighting and a full length mirror (lacking in many Accor hotels).Bathroom needed a bit of attention as it was looking dated, a plug that didn't fit the bathtub and not as clean as we would expect for a Pullman Resort. We were provided with extra bath towels which were thick and soft. Our room (on the top floor) was pleasantly quiet.The bed was comfortable - not firm but not soft. The light meals at the Walpa Lobby bar were great, but the one night we dined in Ilkuri Restaurant was pleasant but the food wasn't anything to rave about. The wait staff were attentive and friendly though. The one biggest disappointment with this Resort, as a Accor Member, is that our membership card wasn't accepted for breakfast. The first time this has ever happened in all our years as members. And the charge for breakfast is $44 per person! There is no way most couples would eat $88 worth of food for breakfast. Avoid the over-priced breakfast here and walk the short distance to the little village where there are several Cafes. Overall a pleasant stay thanks to the attentive staff. Avoid the main restaurant though. This was our 2nd trip to Sails (our first was 15 years ago). I was pleasantly surprised to see how well maintained the property was after all these years. Bathrooms were newly renovated when we visited last time - the same bathrooms looking a little dated now. Shower curtain and having to step into bath to shower are a bit yesterday! Staff, spacious rooms, fluffy towels and crisp linens all very luxurious, Lack of a moisturiser/body lotion in rooms was unexpected for 5 Star hotel. Pool area looked inviting but the icy cold water was a shock when you dived in. Pool heating and a gym would push this resort into the true 5 Star category. Ate at Walpa Bar and found this excellent for a relaxed meal. As we are not buffet types did not try breakfast or dinner at the restaurant - high prices and style of dining not ideal for a large family. Make sure you book experiences prior to arriving as some of the experiences we were interested in were already booked out when I attempted to book 6 weeks earlier. Sunrise camel trio and Sounds of silence Dinne excellent. Walk through field of lights was overrated - we were unable to book star pass which may have made field of lights a more positive experience. The cheaper options of Hiking around rock and Olga’s, and driving to sunset car park were the best experiences of them all! Sails was the perfect base to visit all the iconic places of Uluru. The rooms were comfortable and relaxing. The service from reception, restaurant to room staff was friendly and efficient. The Sails resort was large, facilities great and enough pool chairs and lounges for everyone. Can’t fault the Pullman, great staff, great service and the rooms, while dated were better than average. The food was also high quality especially the buffet breakfast and drinks were very well priced considering the location. This pretty resort slightly misses the mark. The elevator malfunctioned on the way to our room. There was a critically missed wakeup call. There were little bits of litter in the hallway area not picked up for days. The room telephone was unusable. Great accommodation with attentive and professional staff. The resort was excellent and the food very good. The facilities were excellent and well maintained. I would recommend it to anyone wanting to stay at Yalara. Odd that public areas looked fine and room was OK, but exterior of accommodation block looked like a council estate. Not important to me, but it rather punctures the idea of a luxury resort. AIr conditioning in the room was pretty feeble. Cold if you stood directly under the aircon unit, but away from there it was getting quite warm even in mid October. Food in Desert Sands seemed better than at Sails. Baggage took a long time to arrive at room, presumably because lots of people arrive at same time. Staff were Ok. Five stars for Meenakshi at check in / concierge. Alert, friendly, intelligent and helpful. Well worth hanging on to. I give an average score for value given the remote location. In a city the value would be poor. We really loved our time at Yulara. Accor has a really great setup here with accommodation & meal selections being 2nd to none. We stayed at Sails but ate at Desert Garden, Sails and the town centre - highly recommend the buffet at sails. The rooms have been upgraded except the bathrooms are a little tired. We found the staff to be excellent and looking to make a difference to your stay. We had a small issue that was resolved with a quick chat. Definitely a recommended for me. 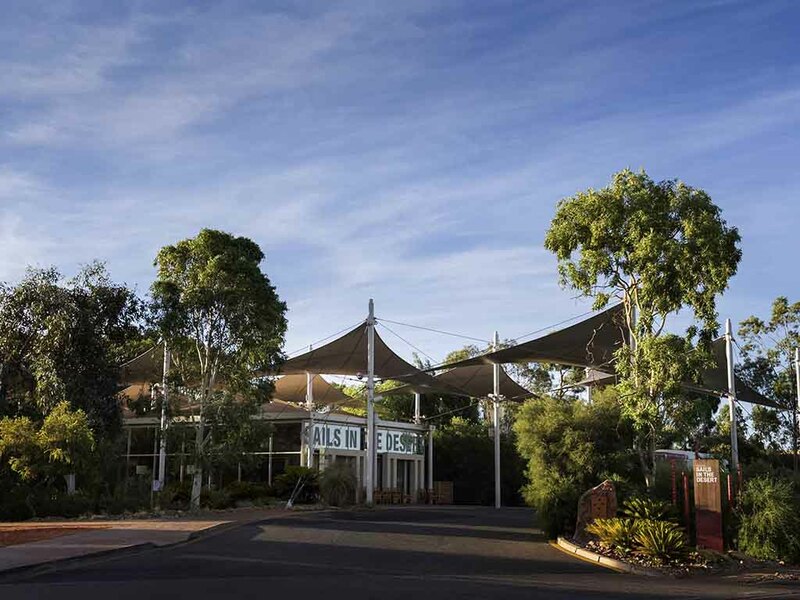 Sails in the dessert is a low rise hotel that is part of the Yalara Resort. Staying at the resort includes transport to and from the airport as well as access to the free resort shuttle. Very friendly staff and well presented common areas add to the appeal. Rooms are spacious and offer a lounge area as well as a desk and a balcony. Bathrooms are a little dated and could present access issues as the shower is over the bath. Main access to the rooms is via stairs, there is a lift but this is a little out of the way. Pool is heated but not warm enough to swim when we stayed. Lovely buffet breakfast and good range f light meals offered in the casual eating areas. Hotel is a little pricey but there's not much competition out there. We really enjoyed our stay and would be happy to recommend this hotel. Excellent hotel with friendly staff. My only negative comment would be the temperature of the water in the pool - it was freezing, even my kids were reluctant to swim. The rooms were lovely and comfortable. Room was spacious and well maintained. Great breakfast! The guest laundry was unexpected but a real plus and a nice touch. Rooms were ready earlier than guaranteed which helped. This hotel is under common ownership with three other facilities at Ayres Rock and we scheduled our trip to stay here. We were very pleased. Let me be straight, it was a fantastic hotel. The room was lively, swimming area and snacks at the bar was top notch and breakfast was very close to perfect. There is one tribe in the bathroom that whoever paired the taps with the sinks needs to be fired. There is not bough room to get your hands underneath. Stupid design error. The biggest issue was by far that we know there is much insect life in Aus. At 10pm the area from hotel to the rooms was full of beatles and some got into the hotel. Still understandable. But the inside of the hotel when walking to the rooms after breakfast was still full of bead insects. I mean full. Considering many people get up early to look at sun rising at Ayers Rock, this is totally unacceptable. This should have been cleared up before 6am, before breakfast opens and not after late breakfast. Manager needs to address this. We stayed 3 nights at Sails in the Desert Hotel. We really should have stayed 5 as we loved every minute of it! 3 days is the absolute minimum. We experienced the Sounds of Silence dinner (a must), a sunrise tour and base walk of Uluru & a sunrise tour & Valley of the winds hike at Kata Tjuta. We would have liked another day to rest & enjoy the resorts facilities & perhaps even added on another tour! Put it on your bucket list! We stayed at Sails in order to attend the Field of Lights installation and the associated dinner. Extremely lucky with the weather which made the trip even more memorable. The staff were great. Breakfast excellent and a light dinner at the bar area good value. I think we were lucky to have a small view of Uluru as I don't think many rooms have this view. The hotel seems to be very well maintained but there ar some areas that need a little attention. Car parking is a problem as the car park closest to the hotel is very small but two other areas close-by can be used. Overall a great trip made even better with the accommodation. Perfect location for viewing both Uluru and Kata Tjuta. For its location in the middle of practically nowhere, this hotel was very comfortable. The interiors were impressive with touches of Anangu art as decoration. Our terrace room was very comfortable and had a lovely terrace overlooking the gardens and pool but we were unable to use it as the weather was unexpectedly overcast and rainy with thunderstorms. There is no longer fine dining available on the property, just a buffet restaurant and an adjacent area for lighter meals and drinks. The property exterior seems dated and is not as attractive with ugly metal fence-like grating around the periphery of the rear of accommodation buildings.